The ranch is located south of Half Moon Bay at 1500 Purisima Creek Road. Please observe our 5mph speed limit as you turn off of Purisima Creek Road on to our access drive and all the way to the ranch. Take Hwy 1 South through Pacifica to Half Moon Bay. Continue on Hwy 1 south 4 1/2 miles past the Hwy 92 intersection. Look for the green “UC Elkus Ranch Next Left”sign. Turn LEFT onto Verde Rd./Purisima Creek Rd. and continue on Purisima Creek Road for approximately 2 miles. Look for the light green “Elkus Environmental Education Center & UC Cooperative Extension” sign and turn RIGHT into our access drive. Follow drive past the horse pastures and down the hill to the ranch entrance. 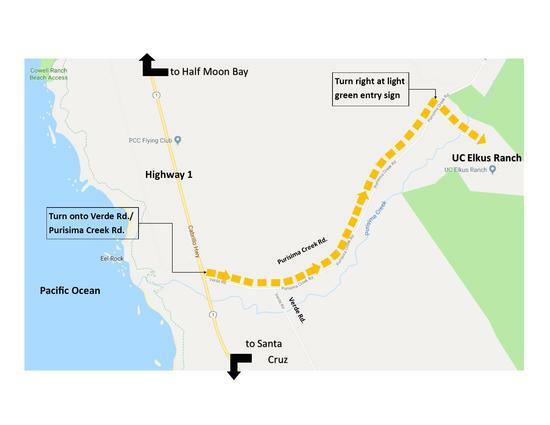 Take Hwy 92 WEST to Half Moon Bay. At Hwy 92/Hwy 1 intersection, turn left and travel 4 1/2 miles south. Take Hwy 1 North toward Half Moon Bay. Look for green“UC Elkus Ranch Next Right” sign . Turn RIGHT onto Verde Rd./Purisima Creek Rd. and continue on Purisima Creek Road for approximately 2 miles.